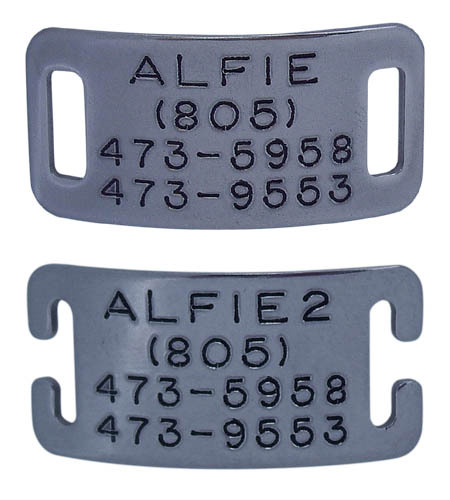 Belt-buckle collar - use a slide-on tag. Nylon: Select the "adjustable" style below; it will be snug, but we guarantee it will not fall off. Please note that the belt-buckle slide-on style will NOT work on 1/2 inch wide nylon collars. This "miniature" size is limited to 4 lines of text. For wider collars that are 5/8", 3/4", or 1" wide, we offer three tag styles to fit on almost any collar. Please click one of the links below to see the correct product.